James Neiss/staff photographerNiagara Falls, NY - MILITARY APPRECIATION: Rev. Robert Scott, the new pastor at Calvary Baptist Church, is holding a military appreciation service and free meal on Sunday to honor area veterans. 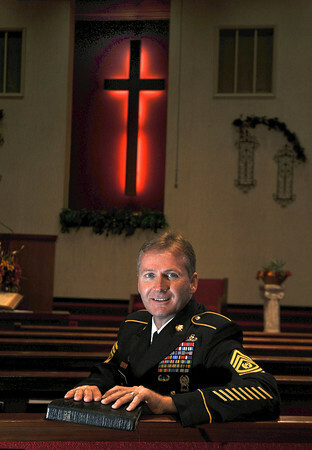 Scott, seated here in his uniform inside the church, spent 25 years in the U.S. Army and retired as a command sergeant major before beginning his ministry. Nine weeks ago he arrived in Niagara Falls with his wife Kim from Augusta, Ga. to take the role as pastor for Calvary Baptist Church at Pine Avenue and Hyde Park Boulevard. The military appreciation service is planned for 10:45 a.m. Sunday at the church. A free meal open to all will be catered by Michael's Restaurant at noon. Those needing a ride or more information are asked to call the pastor at 255-5507.